Tools to help you repair your home and tame your yard are a great investment, but they need maintenance. Many tools, if improperly maintained, will eventually need to be repaired. If you've invested in a chainsaw and have noticed that it's chewing through wood instead of slicing through it, it may be time to sharpen that blade. For this reason, it's important to know how to sharpen a chainsaw properly. The exact steps on how to sharpen a chainsaw aren't terribly difficult, but it does take some focus and attention to detail. 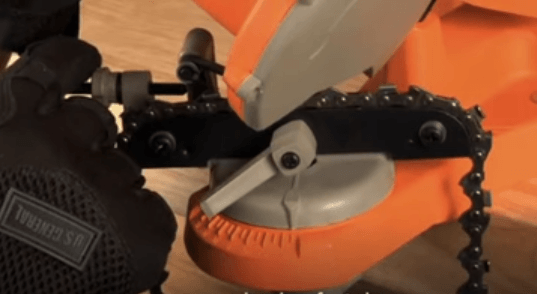 You can sharpen your chainsaw by hand using a file, or you can sharpen it with an electric grinder and tool jig built to help you set the right angle and cutting depth. When Do I Need To Sharpen The Blade? Chainsaws, like a lot of other power tools designed to cut things, will happily cut whatever they bump up against. Chainsaws have the added risk of being sharp on the top and bottom and putting you at risk of kickback. Kickback is when the blade of the saw bounces up from whatever you're trying to cut, sending the top of the blade bouncing toward your face and neck. 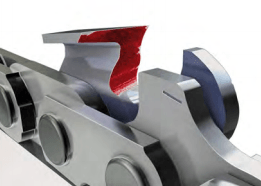 Dull blades require a lot more pressure than properly sharpened blades, and the more pressure you're putting on the blade, the more severe the kickback can be. Keep your saw bar out of the dirt. 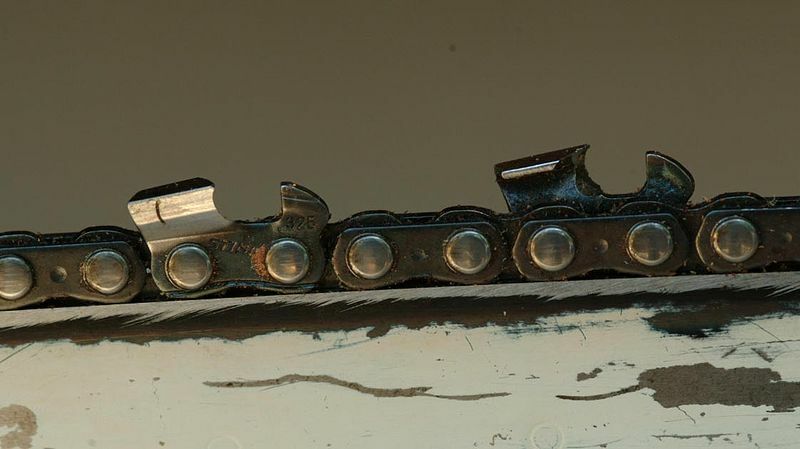 The grit will cause unnecessary wear on the chain links and the cutting edges. Make sure you have the right chainsaw lubricant for your saw and that the bar oil level is adequate. Avoid cutting on cold days; ice will dull your saw. As best you can, avoid metal. Old nails and bits of wire are almost impossible to avoid when cleaning up fencelines, but if you clip metal, be sure to sharpen the chain immediately. The rule of thumb on when to sharpen the blade has never been very specific, and each user has their own rules. 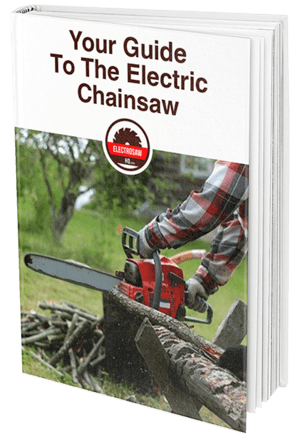 Many instructions recommend sharpening the blade with every other tank of gas, but electric and battery-powered chainsaws can make this confusing. Remember that your job is to guide the saw, not to force it. If your chainsaw requires a lot of downward pressure to cut, the blade is too dull. Also be aware of any debris in your lumber; if you connect with something hard, such as wire, a nail or ice, you'll need to sharpen the blade. 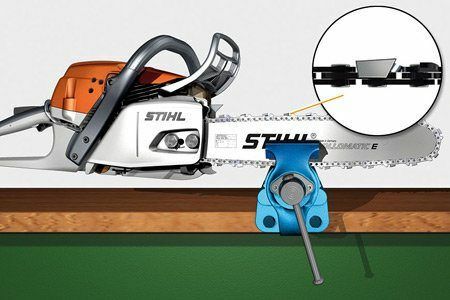 Your chainsaw blade includes flat links with no cutting edge and cutting links with an angled link extension. On this link extension, part of it is flat, or 90 degrees to the blade, and part of it is angled. The angled edge is your cutting surface and thus the edge you want to sharpen. Studying these chainsaw sharpening angles is critical if you're going to wind up with a safely sharpened blade that actually does the job. You need to sharpen the correct angle, sharpen all those angles evenly around the chain, and get the chain back on the saw at the proper tension. To sharpen manually, as displayed by Doublewide6 Repairs, LLC, in the following video, you'll need to stabilize the saw. If possible, a bench vise is ideal. The other tools you'll need are listed below. To sharpen electronically is demonstrated in the following video by Tool Dude Tony, you'll need a track for the chain to rest in, an angled cutting blade with a stop so you don't damage your chain, and to set the stops correctly to avoid taking off too much metal in your sharpening process. You can suspend the entire weight of your saw by the bar on a bench vise. You'll need to clamp the saw blade deep in the center of the blade. If you're too close to the edges, the chain won't travel around the saw blade and you may damage the saw. Once you have the saw suspended, pull the chain around to make sure it's loose and will move easily. 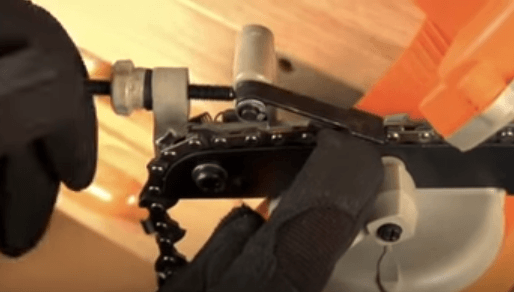 Not only does this process increase the likelihood that you're sharpening the correct edges of the blade, but you don't have to re-tighten your chainsaw chain back onto the bar; the chain is never taken off the blade for this method. This would be a great time to put on your gloves. Neoprene or latex gloves are a great option for this application. 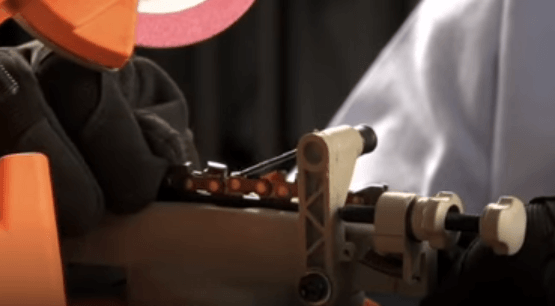 You get to protect your fingers from metal shavings and still enjoy decent dexterity. Buy and use the correct sized chain file. 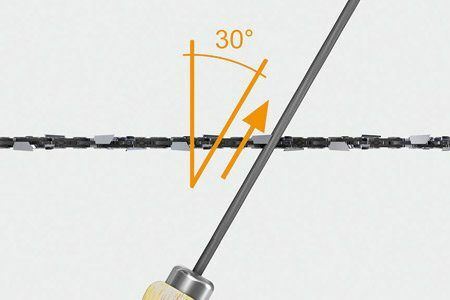 Your chain will have a specific tooth depth, so be sure to check in with the experts at the store where you bought your saw and get the right file. If you inherited your chainsaw, you may need to take your saw to the shop to make sure you're getting the right file. In fact, if you inherited your saw or got it at an auction or farm sale, it's a good idea to get the whole unit checked out by a professional. Chainsaws are great tools, but they come with serious risks and a safety check is a great investment in your well-being. Pushing the file away from you won't require a great deal of pressure; all you're trying to do is shave away the dulled edge of the cutting link and expose a new, sharp edge. However, if you drag the file back towards you, you risk damaging the edge you just created and drag metal shavings back into the saw links. Think of it as clearing the blade; you're pushing that dulled edge away and out of the saw. Staying even is critical to sharpen a chainsaw properly. If your saw blade winds up at an uneven sharpness, the chain will pull and the saw won't cut evenly or smoothly, wearing out the muscles in your hands and forearms and putting you at risk of injury. Additionally, an uneven saw blade will produce more sawdust than a uniformly sharp blade, and sawdust gums up the motor as ​well as sprays back at your face and eyes. Goggles and ear protection are critical! Once you've sharpened one side of the blade, you're ready to flip your saw in the vise so you can access the other side of the blade. Use the steps as described above to get a saw blade that provides a smooth, even cut. Your chainsaw has to work in rough conditions. Dirt, sawdust, and wood are often loaded with bacteria and mold, and filing away metal from your chainsaw blade can put your fingers at risk. Metal shavings can break the skin and lodge there, leaving you at risk of infection or painful inflammation. To sharpen your chainsaw blade with an electric grinder, you'll need to remove the chain from the bar. 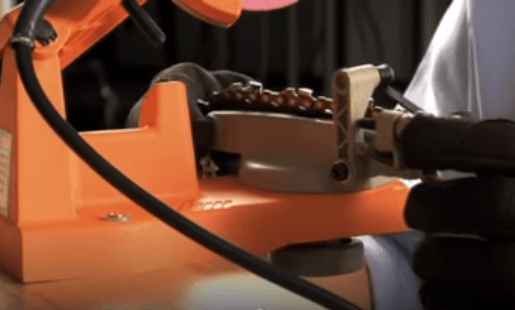 The tool depicted in the linked video about electric chainsaw sharpening instructions requires you to run your saw chain over a tool jig with knobs to manually advance the saw blade to the next link. Line up the angle of the saw with the angle of your cutting edge. This is critical and may be rather fiddly; you want to make certain that you find this angle and lock it down so that each cutting edge has the same angle. Set the stop for your grinder blade so you don't cut too deep and damage the chain. 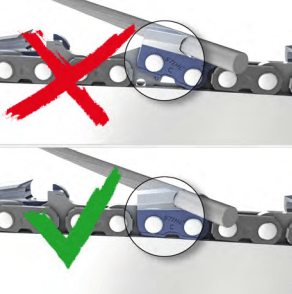 If you cut too deep into the angle of the cutting link, you can shorten the life of your chain and put yourself at risk for a broken chain while the saw is in use. This is a very dangerous situation for the user and anyone near them; the portions of the blade that can't cut wood will still cut flesh. When in doubt, go shallow! Once one of your cutting links is too narrow to be sharpened, your chain may have to be disassembled or replaced. When you're ready to sharpen the second set of cutting links, you just need to rotate the chain holder and reset the cutting stop. It's a good idea to re-check your cutting depth at this point. 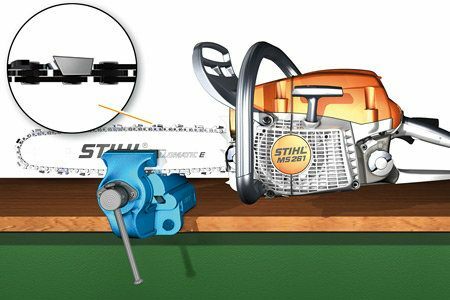 When checking out electric chainsaw sharpener reviews, it's important to remember that this is a task that calls for a lot of focus on each link; it's unlikely that you'll be able to set the jig and simply advance and cut without having to double check the amount you're grinding off or your cutting depth. There are limitations to any tool. When working out how to sharpen a chainsaw blade with an electric sharpener, remember that once you grind away metal or cut too deep into a link, you can damage the whole chain, making it unusable. Be certain to go slowly and keep a careful eye on the results. Be honest with yourself about plastic. Many chainsaw sharpening jigs have metal stops and brakes, but they have plastic handles, and plastic flexes. If you think you have things lined up properly, double and triple check your cutting depth, angle and the amount of material you're likely to take off. One over-sharpened link can result in uneven chain wear, and uneven chain wear puts you at risk of a broken chain. Put the chain back on the saw. Once you've got the saw reassembled, you can perform a snap test to make sure the chain tension is safe. Gloves and eyewear are critical! Lift the chain from the top of the bar at the center and quickly release it. If properly tightened, the chain will snap back into the top rail and not sag along the bottom. If it sags or doesn't fit snugly into the rail, it needs to be tightened. Also be aware that warm chain will expand and be looser; you may need to snug it again after you've used it. 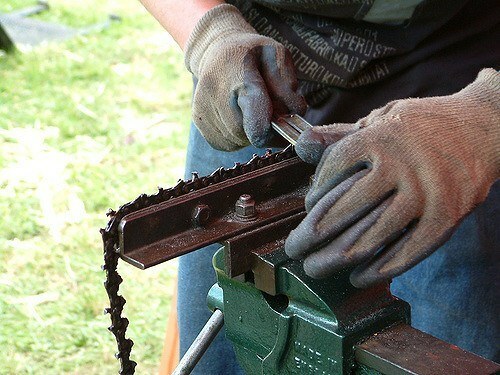 A loose chain can come off the saw, bind or snap. Any of these scenarios can be extremely dangerous, so keep an eye on the chain throughout the course of your cutting day and tighten it if necessary. 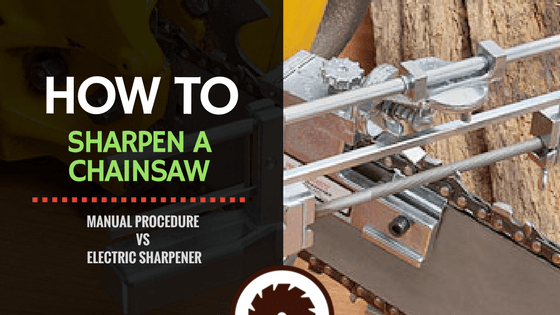 While there may be a professional-grade chainsaw sharpening machine that doesn't require such careful monitoring, generally the construction of such a tool would price it out of the market for most home users. The best way to sharpen a chainsaw is the method that leaves you with a safe, usable chain with plenty of life left in it. Before you invest in a chainsaw sharpening jig, you might want to check prices on getting the blade professionally sharpened. Many shops that offer chainsaw sharpening also do small motor work; you could get your saw cleaned, tuned up, sharpened and ready to roll for the same amount of money you might spend on a sharpening jig at home. Be sure to factor in your time when making this decision! Please let us know if you found this tutorial helpful. We're excited to help people keep their tools working safely and well so they can get around and do the work that needs to get done. Let us know what you thought, and happy sawing!